Nov 17 By Jen 277 Comments This post may contain affiliate links. When I was a kid, my mom made stuffed bell peppers all the time. They’re one of my dad’s favorite dishes – he loves bell peppers. After I got married, I made them for my husband. Him being the sweetheart that he is, told me he liked them but… wouldn’t it be great to have the filling without all that bell pepper? Haha! So… that stuffed bell pepper recipe was morphed into a stuffed pepper casserole. Leaving behind the bulk of bell peppers and cooking them until softened along with garlic, onion, ground turkey and spices. Oh, and rice of course! 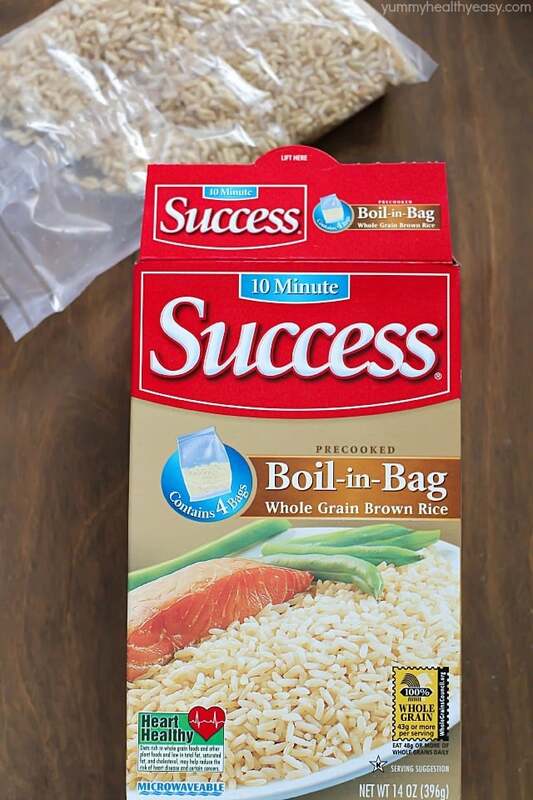 My favorite rice is Success® Rice. I always have a box of the Whole Grain Brown Rice on hand. Usually brown rice takes 45 minutes to cook, but not Success Rice. Success Rice is the ORIGINAL no measure, no mess boil-in-bag rice that cooks perfectly every time and is ready in 10 minutes. It’s just about the easiest thing to make. Success Rice is pre-measured in a convenient colander-style Boil-in-Bag, and the Brown Rice can sit for up to 30 minutes in hot water with the heat off, before being served, making it foolproof (so can Success White Rice). Success Brown Rice has the same taste and similar nutritional benefits of long cooking brown rice, but cooks in ¼ the cooking time and it’s gluten-free! Success Whole Grain Brown Rice and Success White Rice are also availabe in larger family size 32 oz. bags. I love having people over for dinner. I have the best memories of eating dinner with friends when I was growing up. But let’s be honest, sometimes entertaining can seem stressful. But there are ways to take shortcuts that won’t sacrifice quality. 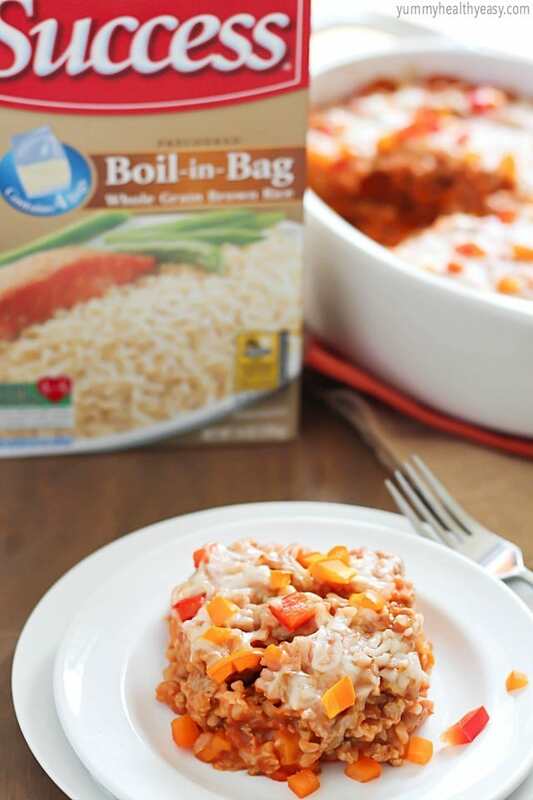 Whether that’s bagged, pre-washed spinach for your salad, pre-made sauces (many stores carry prepared tikka masala sauce or curry sauces) or Success Rice boil-in-bag rice, you’ll pull off a successful dinner with the help of convenient ingredients like this. 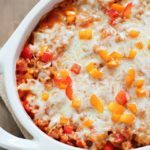 This Stuffed Pepper Casserole is a great meal to serve to your dinner guests, whether it’s friends, family, or both! It’s an easy casserole to whip up, feeds many people and will definitely satisfy! It’s perfect for holiday entertaining. This is honestly one of my boys’ favorite dishes. When they ask what’s for dinner and I tell them Stuffed Pepper Casserole, they get so excited! I love that I can use Success Rice and make this an even easier dinner success (pun intended ;). Preheat oven to 350º F. Spray a 1.5 quart casserole dish with cooking spray. Set aside. Pour olive oil into a saucepan over medium heat. Add in diced onion and cook until soft. Now add garlic and peppers. Cook until peppers are softened. Crumble turkey into pepper mixture. Brown and then drain. Add cooked rice and then salt, tomato sauce and spices. Stir in 1/4 cup mozzarella cheese. Pour into prepared dish. Top with remaining 1/4 cup cheese. Cover and bake for 30 minutes, then uncover and bake for 10 more minutes, until bubbly. Serve up and enjoy! This sweepstakes runs from 11/17/14 – 12/26/14. Be sure to visit the Success Rice brand page on BlogHer.com where you can read other bloggers’ posts! 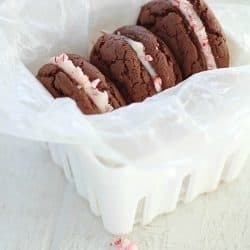 « Ginger Crinkle Cookies + $250 Gift Card Giveaway! Here in New Orleans, gumbo is definitely our favorite holiday rice dish – it’s a favorite any time of the year. In the fall/winter, I love acorn squash stuffed with wild rice. I love making stuffed peppers using rice. We like to make a Cranberry Walnut Rice dish during the holidays. I like to boil broccoli with my rice & top it with cheese! 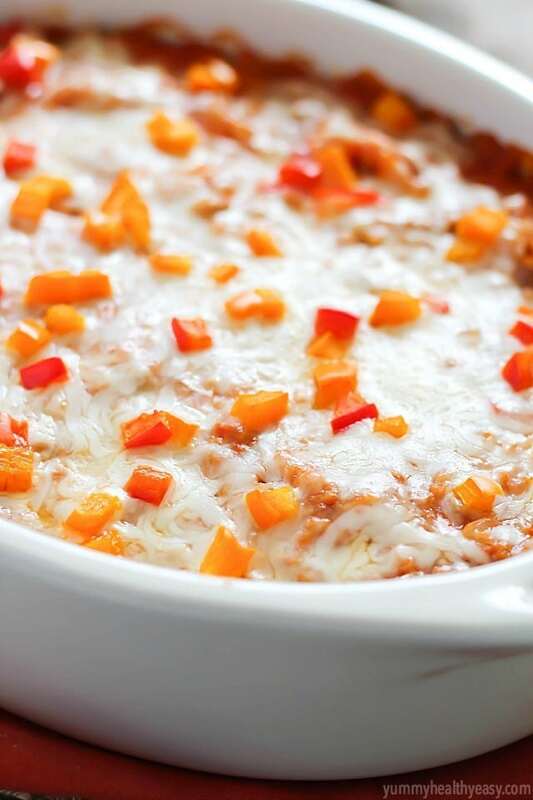 This stuffed pepper casserole looks like a total crowd-pleaser! 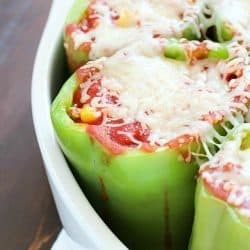 Stuffed peppers are one of our favorite meals, and I love the idea of throwing all of those ingredients into a casserole. And just look at that cheese! Truthfully our go-to rice is just rice cooked with green pepper and onion for flavor. We eat it as a side often. After that, we are big fans of risotto – especially mushroom. We make a sweet n sour rice dish. One holiday and winter in general go to is chicken rice casserole with mushroom sauce, it’s delicious and very hearty, easy and cheap! We eat a lot of chicken fried rice, it’s a favorite of everyone! I love to make broccoli cheesy rice! my mom has made “chicki-rice” since i was a kid! I have an easy and delicious Chicken Parm recipe that I love to make ! Chinese style fried rice is the go-to dish around here. Quick and easy to make. I’m Spanish and hubby is Portuguese so it has to be paella! During the holidays and Winter months our go to rice dish is chicken over rice. Love having our butternut squash soup. 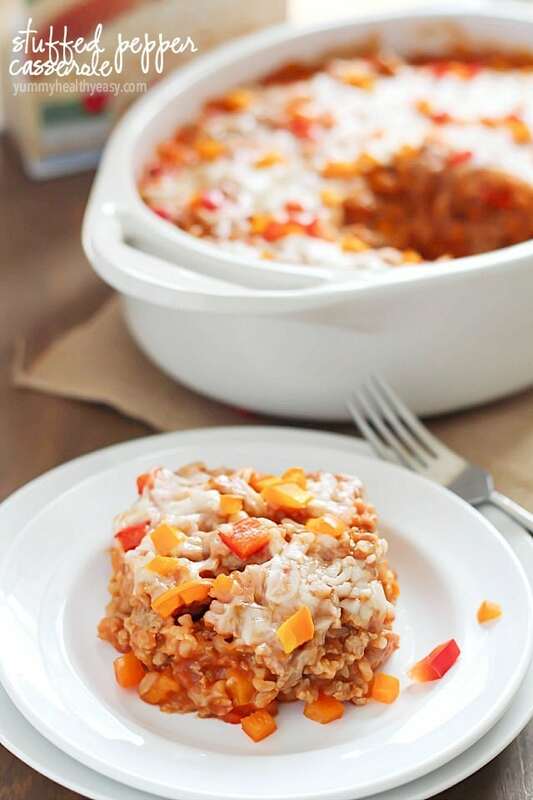 Love rice with lots of fresh peppers and chicken – in the crockpot! I like a good broccoli, rice, and cheese casserole. My dad makes a rice/sausage/pepper dish that is total comfort for me. It isn’t the healthiest but so worth it! During the holidays, our family’s favorite go-to rice dish is a cheesy broccoli chicken rice dish using brown rice. We love chicken broccoli rice casserole during these ocld months! I love to make fried rice! My goodness Jen – these images are GORGEOUS! Our “go-to” dish is something the kids call “daddy delicious” sort of a mix it all up rice sort of dish that they absolutely love. My family’s go to rice recipe is baked chicken & rice. We either have yellow rice or rice pilaf. I love rice pudding with dried cranberries and almonds! We nearly always have Cheesy Broccoli Rice casserole for Thanksgiving AND Christmas! Wouldn’t be the holidays without it….thanks for the chance to win! Our go to rice dish during the holidays is my cheesy chicken and rice and broccoli casserole! I love rice pudding! Stuffed acorn squash is also a great side dish. My family’s go-to rice dish is a yummy chicken, Success Rice and broccoli dish. I’ve made a few variations of it, but it’s always good and the dish is emptied! 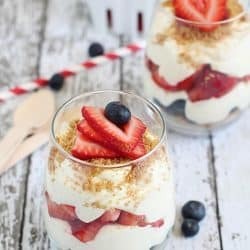 My husband loves my crock pot version of “Rice Pudding” using coconut milk and other goodies. Chili over rice is one of our favorites! I make Broccoli Cheese Rice Casserole every Thanksgiving and Christmas. It’s a tradition. we do chicken and rice casserole! Our favorite is very simply rice with lots of butter! Goes great with leftover turkey. We love making Turkey Rice and Gravy. We are all about the rice down here in Louisiana! This casserole sounds so good! Chicken and Rice cooked in Leek Soup. Our favorite holiday rice dish is Broccoli Rice Casserole. Our favorite is Chicken and Rice soup. We love to make homemade chicken and rice soup. Love this idea! Casseroles make dinner so easy! I bet this one has so much flavor! Our favorite holiday rice dish is Broccoli and Rice Casserole. I don’t know why I don’t make it more often, but it’s a chicken (or turkey!) casserole that includes rice, cream of chicken soup, green chiles and cheese. It’s something my mom used to make, and one of very few things I make without a recipe. this recipe sounds great- i will definitely give it a try!!! Thanks for the recipe! I would have to say that it’s rice pudding. My family love it. my go to is brocolli and cheese casserole. we love to make a knock off version of Chiplotle’s cilantro lime rice. We eat it with everything! We love stuffed roasted red peppers with the stuffing mixture being made with brown rice, onions, garlic, tomato sauce, etc..
we like to make stuffed red peppers with rice inside of them! i love red rice and beans but i can never get it the way my mother makes it. my go to is just some plain white rice! That looks delicious. I have always loved mostly anything with rice. Our family’s favorite has been a chicken and rice dish. In which sometimes we add extra veggies and sometimes we add a bit of cheese! My family loves broccoli cheese and rice casserole and rice pudding during the holidays. Our favorite is broccoli cheese rice casserole! I have pinned this to so many boards. It looks delicious! Butternut squash and sweet potato wild rice casserole is my family’s favorite go-to rice dish during the holidays. Our favorite rice dish for the holidays is Cheesy Broccoli Rice Dish. Perfect side dish for any holiday! We make a chicken, broccoli rice casserole tgat everyone loves and eats up. My husband makes this delicious cheesy rice dish with diced green peppers. It is sooo good. Everyone loves it & we usually have it at our Putting Up the Tree party. We love cheesy broccoli rice during the holidays. Cheesy broccoli rice casserole is always a nice side dish for the holidays. My grandmother used to make a delicious hot cinnamon rice pudding I loved. Never have been able to replicate it though. My husband loves chicken broccoli casserole. My favorite is black beans with cilantro lime rice. This looks yummy! Our to go favorite rice dish is chicken over rice. Please delete, I forgot the hashtag. During the busy holiday season I like to make rice black beans and salsa. As much as we love the big holiday turkey dinner, our favorite part is a few days later, when I make stock from the turkey carcass, then make a delicious sauce using the stock, to which I add all the meat I pulled from the carcass along with any leftover cooked veggies. This lovely mixture is served over rice, and it truly is my spouse’s favorite meal. Looks delicious! My kids like pretty basic rice dishes — cheesy rice, rice and beans, broccoli and rice… I like mine with roasted veggies! We love chicken with rice. I love to cook my rice with coconut milk! Then mix it with leftover ham/turkey from Christmas. 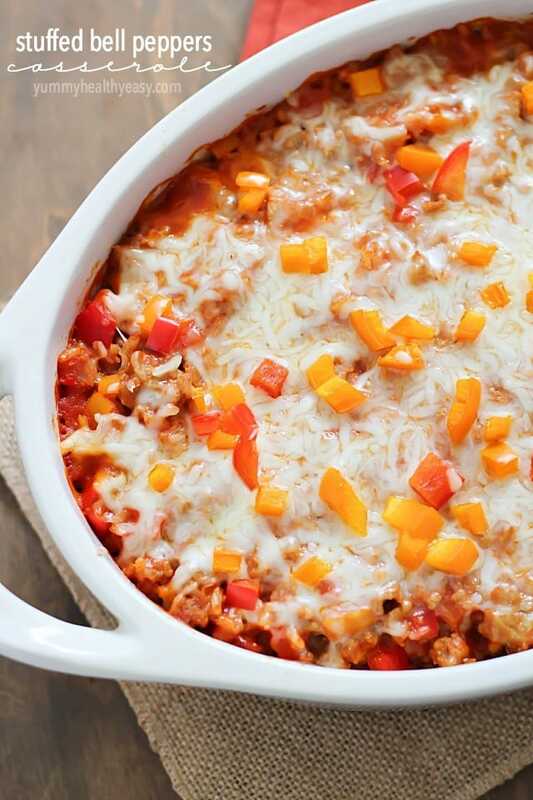 That stuffed bell pepper casserole looks delicious though! I remember my grandma making a rice pudding out of goats milk that was so delicious .. Stuffed Peppers is one of our favorites. We love chicken stir-fry. It’s super easy to whip up some rice, throw in some chicken, frozen veggies, pineapples, and soy sauce. 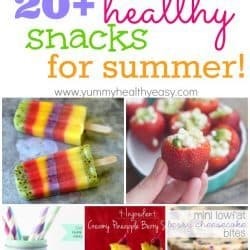 It’s quick and easy and my whole family loves it. We have rice with anything. Chicken and rice is a family favorite. This looks good, and I love cheese on just about anything. We often serve rice pilaf with holiday meals. It goes with lots of different entrees. Spanish rice!!! I make it with quite a bit of green pepper, and it is a healthy, low fat recipe – a great comfort food! We like chicken and rice and broccoli and cheese casserole. sausage, rice, broccoli and cheese! Chicken or pork stir fry is always a quick & easy meal and a big hit around our house. I like rice with peas and tuna during the hectic season. We like rice with sugar and milk on cold days. It’s a nice treat for the girls. thank you! My mom got a chicken and rice recipe off a ketchup bottle when I was in school (over 30 years ago). We still love it. My go-to holiday meal that has rice in it is Chicken with Stuffing and Gravy over rice. It is simple and delicious. Always looking for recipes. Have a son in law who loves stuffed peppers this is going on the food list for dinner x-mas eve! We like to make broccoli, cheese and rice. We’re simple in our family, we just love rice pilaf! We love rice pudding with lots of nutmeg on top. It is a creamy comfort food that is good for you too. Chicken (or turkey) rice casserole is our favorite go-to holiday dish. We heart tomato soup with rice! 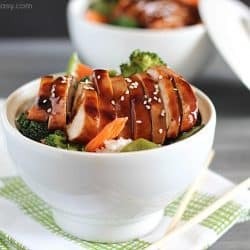 My favorite go to rice dish is Orange Chicken over rice! We use jasmine rice because it has a wonderful flavor. Cook it in a chicken broth and add a dab of butter. Nothing fancy but absolutely delicious. We like to eat stir fry with rice and steak. Our favorite is marinated flavored tofu over rice. It’s quick & easy to make on the rushed days. Thank you for the giveaway! We love rice and our favorite dish is chicken fried rice ! Rice with chicken is the go to rice dish in my family. We usually like to make rice pudding. I make jambalaya as my rice dish. fried rice with chicken flavor. The boyfriend always makes sushi rolls as appetizers. I love adding rice to the stuffing! We like diced cooked ham, corn, and lima beans, mixed with cheddar cheese soup, then poured over cooked rice. Delicious! What’s your family’s favorite go-to rice dish? Sticky rice with chicken and peppers mixed in. We don’t have a rice dish for the Holidays. We do like to make casseroles with rice, no go to recipe though. We make Bulgogi over rice. My family’s favorite go-to rice dish is Jambalaya. Cheesy broccoli rice casserole is my family’s go-to dish. Especially around the holidays! Fried rice is a favorite year round. It’s so easy to use leftover chicken, pork or steak or to buy a few shrimp to change up the flavor. Cheesy crockpot chicken over white rice. Yum! We like to have rice topped with stir fried vegetables. Pretty much it’s just plain old minute-rice. I love to top my rice with an Indian curry. We do not actually have a holiday dish that includes rice. We use rice year round though. One of my fav meals is our mushroom cheddar rice bake. SO good! Ever year I make my Cajun red beans and rice. I am from Louisiana and I learned that getting real Cajun red beans and rice was impossible in Kansas. So I make it myself and everyone loves them so I make them for my family and I make them once a month for the workplace. We like Cheesy Broccoli Rice casserole. My family’s go to rice is spicy jambalaya, great with grilled chicken. We love any brown fried rice recipe!! We don’t make rice dishes during the holidays but we like cheesy rice when we make chicken. Our favorite go to rice dish during the holidays is spanish rice and sausage. Spicy green chile pork stew over white rice is my family’s favorite. My family’s go to rice dish during the holidays is Paella. We make fried garlic rice with lost of veggies and spanish sausages. Thanks! during the holidays, I fortunately don’t have to cook at all! but my aunt makes this yummy cheesy and broccoli filled rice dish that everyone loves! at home, I like to make a yummy dish inspired by enchiladas with salsa and lots of cheese! Stuffed pepper casserole? 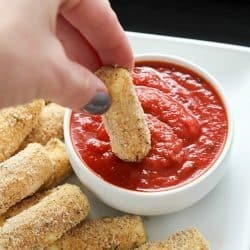 Im making this tonight! YAY!! I hope you like it! It’s one of our favorites! I made this for my crew (we are firefighters) to a T except I added a little more cheese. The guys adored it, even one who said he didn’t like stuffed peppers! It was easy and delicious and comforting. SO happy you liked it! Thank you for the nice comment! Chicken and rice or stir fry! It’s a keeper! 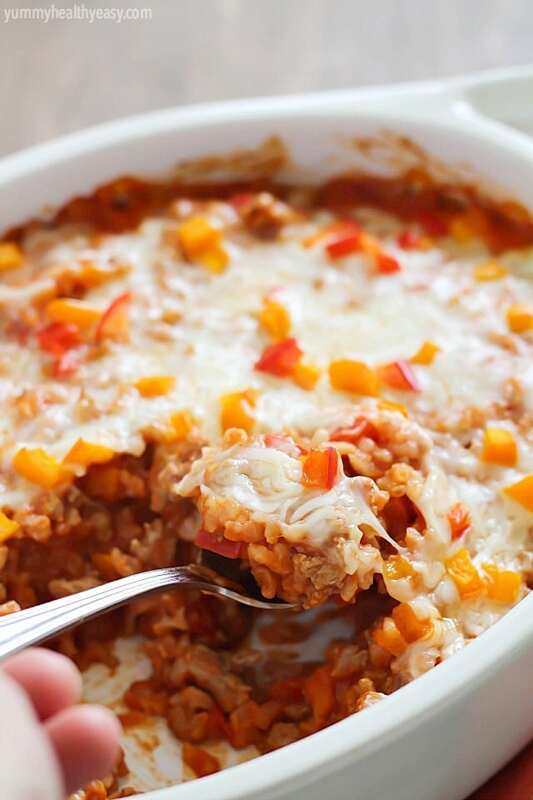 Ground turkey is somewhat difficult to make a flavorful dish, This casserole did the trick! I love that it is made with healthy ingredients. I used a bit more cheese as 1/4 cup didn’t seem like much. Will definitely make this again. YAY!! So happy you liked it! It’s such a yummy and easy casserole recipe!